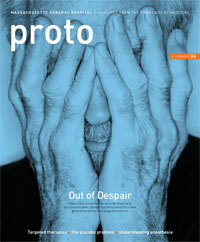 One reader challenges Proto's take on the end of treatment-resistant depression. Several points in the article on vagus nerve stimulation for treatment-resistant depression (Summer 2006) require clarification. First, I disagree that “those aren’t stellar scientific results for a device as invasive, risky and expensive as VNS.” Although every surgery poses risks, patients have tolerated this surgery well. The most common side effect is voice alteration, which can be minimized or relieved by adjusting the device or simply with time. Some 32,000 patients have received VNS implantation for refractory epilepsy since 1988 (the surgery is identical whether a patient is receiving it for epilepsy or depression), and VNS has been confirmed to be safe. Consider too the population that was studied. Subjects had an average lifetime duration of depression of more than 25 years. Many had failed to find relief from as many as 10 different antidepressant treatments. Yet at one year, one-third of patients had a 50% or greater response to VNS, and 56% had at least a 25% reduction in depression. Control group subjects received medication and electroconvulsive therapy. After one year, only 12% of the control group had enjoyed a 50% or greater reduction in their depression. I have seen such results firsthand: I have used VNS to treat patients with treatment-resistant depression, and four out of seven experienced significant improvement. Second, while the $20,000 cost of VNS isn’t inexpensive, neither is treatment-resistant depression. Sufferers often are hospitalized frequently and cost the health-care system an average of $42,000 per year, not including the cost of lost productivity or disability that depression can cause or the loss of life from suicide, which those with treatment-resistant depression commit at a high rate. Finally, the article noted that “many researchers criticize the FDA approval based on what they consider paltry evidence.” But what the critics fail to realize is that the FDA has different approval requirements for medical devices than it does for pharmaceuticals. For devices, the FDA doesn’t require long-term placebo-controlled studies, nor is it the norm. Bill Walkup // Chief of psychiatry, Palmetto Health Alliance; psychiatrist, Midlands Psychiatric Associates; Columbia, S.C. When I read that in autistic brains the frontal lobe is inflamed (Winter 2006), I thought of two trends. Decades ago, parents stopped giving their children aspirin—an anti-inflammatory drug—for fear of Reye’s syndrome. And over the past 10 years, babies have been put down to sleep on their backs, for fear of sudden infant death syndrome. As a result, they’re not able to use their arms, lift their heads and turn over, as they can on their tummies, and perhaps that lack of dexterity leads to a decrease in certain brain activity. I can’t help but wonder whether these two trends could be clues to the increase in autism. I once read about a doctor who figured out that stress affects the course of diabetes after a patient said that her sugar levels jumped when she argued with her husband. The moral is that one never knows when a simple explanation, or part of one, is staring us in the face. My nine-year-old grandson was diagnosed with autism when he was two. I pray for the miracle cure that will give him a normal life. I hope someone takes these comments seriously enough to check into them. Patricia Belmonte // Westchester, Ill.